Dorothy Humel Hovorka was born January 4, 1921 in Cleveland, OH. She was the daughter of the late Sonia (nee Lanik) and James Humel. Dorothy was married to the late Dr. Frank Hovorka, who died in 1986. She was predeceased by her brothers James L. Humel in 1980 and Edward F. Humel in 2011. Dorothy is survived by James B. Humel, her nephew, and Cynthia H. Mowery and Cecily A. Foley, her nieces and several grand nieces and grand nephews. Mrs. Hovorka served as Secretary, Treasurer and Director of the family company, Humel Construction, for four decades. 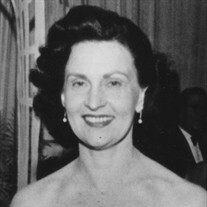 Dorothy is a 1938 graduate of Shaker Heights High School and later established the Dorothy Humel Hovorka Award with the Shaker Schools Foundation. This award is given to the African American student with the highest grade point average in the junior class. Beginning at age eighteen Dorothy studied piano with the brother and sister team of Jose and Amparro Iturbi for six years. Her solo debut with the Cleveland Orchestra playing Tchaikovsky piano concerto was in 1949. Her last solo appearance was in 1959. Mrs. Hovorka's interest in the Cleveland Orchestra continued for decades as she served as Women's Committee President from 1959-1961 putting together the first fashion show in 1960. She served as a member of the building committee for Blossom Music Center and helped create the pre-concert lecture series. She was elected to the board of the Musical Arts Association in 1961 and later became a Vice President. On November 17, 2009 she was elected Honorary for Life Trustee of the Musical Arts Association. She often traveled with the Orchestra. She was a lifelong avid traveler, visiting 118 countries and the North Pole. She was involved with Case Western Reserve University since 1977 as a trustee and served as co-chairman of its Futures Council 1979-1984. From 1986-1988 she was board chairman of the Michelson-Morley Centennial Celebration. In 1987 she was given CWRU's highest honor, The University Medal. In 2009 she received an honorary doctorate of humane letters. In addition to the Orchestra and CWRU she was involved with many organizations, including University Circle, Inc., the Cleveland Museum of Art, the Cleveland Music School Settlement, the Cleveland Summer Arts Festival, the Lake Erie Opera Theater, the Cleveland Women's Orchestra, the Cleveland Institute of Music, the Robert Casadesus International Piano Competition, and the Women's City Club Foundation. Contributions in her memory may be made to The Musical Arts Association (The Cleveland Orchestra), 11001 Euclid Avenue, Cleveland, OH 44106. Services were private.